In conditioning mode, when the mains supply is within tolerance, the synchronous machine is acting as a motor, driving the main shaft and thus the accumulator, storing kinetic energy in it. When the inner rotor rotates at 1800 rpm (60 Hz), the outer rotor then rotates at maximum 3000 rpm. The kinetic energy is thus stored. 99% of the time or more, the NO-BREAK E1 operates in conditioning mode and guarantees the supply of a clean electrical, and conditioned power to the load. In independent mode–during mains failure or voltage perturbation–the stored kinetic energy is now transferred to the stato-alternator, which acts as a generator. This happens without any interruption to the user. Shortly after, the diesel engine starts and couples to the stato-alternator by closing the electromagnetic clutch. The energy is then tranfered from the diesel engine to the synchronous machine and then to the loads. When the engine reaches 1800 rpm, it transfers power to the load, until the mains supply returns. 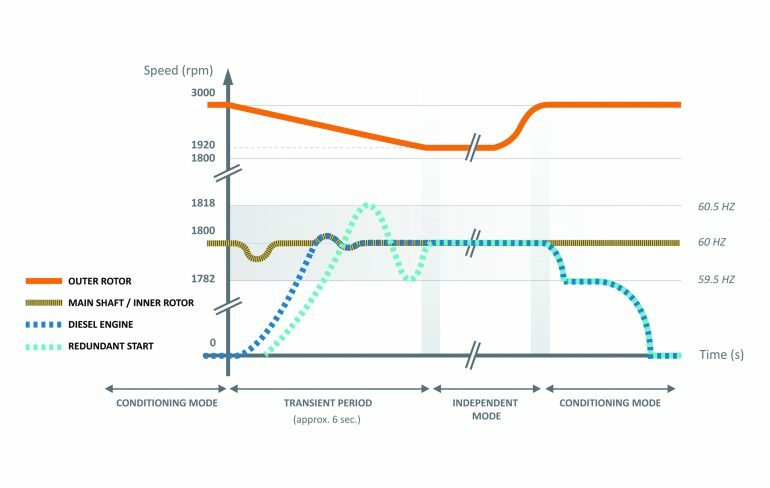 This graph shows the transfer from conditioning to independent mode and back: The frequency is maintained within narrow tolerances, the accumulator’s speed decreases and then the diesel engine starts to provide power to the load. In the event of a diesel engine start-up failure, the electromagnetic clutch will close shortly after opening Q1 and the kinetic energy of the accumulator will start the diesel engine. This givesthe NO-BREAK E1 a redundant start possibility; a second guarantee to start the engine. The NO-BREAK E1 is the only system available on the market that guarantees the start of the diesel engine. The NO-BREAK E1‚ synchronises with the mains supply. The outer rotor is re-accelerated to its rated speed. When the rated kinetic energy is stored, Q1 closes. The diesel engine runs at idle speed for cooling and then stops eventually. The system secures the critical load against an unlimited number of repeated mains failures.